Dog not a fan of taking pills? Try hiding them in Milk-Bone® Pill Pouches, which are designed to fit around most pills and capsules. We’ve all been there: Our dogs are perfect angels… right up until the moment the bath faucet turns on or the pills come out of the medicine cabinet. That’s why we’re here with tried-and-true solutions to help you take the stress out of things many dogs loathe, including taking pills, bathing, nail clipping and wearing clothing. Taking pills is sometimes a hassle for us humans, so it’s hard to expect our dogs to willingly do the same. Fortunately, the appeal of a tasty treat can often outweigh the perceived downside of swallowing medication. 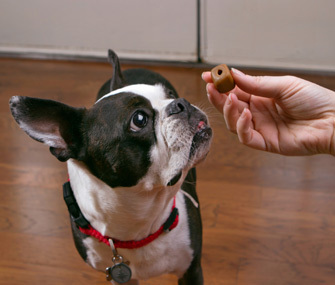 For example, you can use Milk-Bone ® Pill Pouches to hide the pill in a yummy treat — chances are, your dog will be distracted enough by the aroma of real chicken or hickory-smoked bacon flavor to not detect the medication. Now, you could try hiding her medication in human foods like peanut butter, but that can be messy and can add too many calories to your pup's diet. Milk-Bone ® Pill Pouches are designed to mold around most capsules and tablets, making it easy to disguise the medication. And here’s a pro tip: Ask your veterinarian if it’s OK to use a pill cutter to break the medication into halves or quarters and hide it inside multiple Milk-Bone ® Pill Pouches. Just remember: don't feed your dog more than the daily recommended amount of treats. You’re in the bathroom, hunched over the tub and trying to keep your shaking, soapy canine from clambering out the bathtub, wondering if she’ll ever love you again. Fortunately, we’ve got good news: It doesn’t have to be that way! Believe us when we say that there’s plenty you can do to help make bathtime more enjoyable for your dog. For starters, coax her to the tub with treats and praise instead of chasing her down the hallway and intercepting her attempt to hide under a bed. Do your best to avoid things that can create negative associations with bathing, like getting shampoo in your dog's eyes, pouring water over her face or tugging on matted fur in the tub. Instead, use warm water, speak to her in a calming voice, brush her fur gently before and after the bath and reward her cooperation with high-value treats. Just be sure that no more than 10 percent of your dog's daily calorie intake comes from treats. 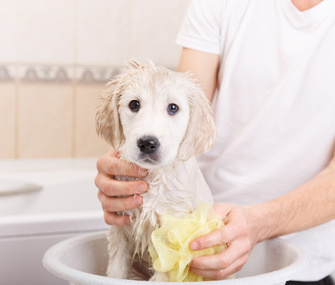 Reducing the negative elements of bathtime can help turn what was once a stressful experience into a sweet bonding activity for you and your pup. Why is it that a minor activity like nail clipping seems to inspire so much drama in our canines? If possible, start handling your dog’s paws when she’s young, so that she grows up being accustomed to having her feet touched. But don’t fret if you’re working with an older dog — many adult canines can be trained to let you handle their paws and trim their nails. If you’ve unsuccessfully attempted to trim your dog’s claws in the past, start with a new pair of clippers that’s distinctly different from any clippers you’ve used before. It seems like such an insignificant change, but making this simple swap might help your dog mentally “start over” with the nail-trimming experience. Reward your dog with treats as soon as you bring out the clippers and don’t hesitate to do this a few times before you even try cutting any nails. You can even use other items, like the eraser end of a pencil, to touch your dog’s nails before you start with the clippers. Once you’ve made it past that step without any fear, squeeze the clippers in your hand so your dog can get used to the sound they make, then progress to squeezing the clippers right next to the claws without actually trimming the nails. Finally, once your dog is comfortable with all the previous steps, start to clip her nails in short sessions and offer plenty of praise. Trim just one or two nails per session and gradually add more nails as your dog becomes more comfortable. It may seem like we’re suggesting a lot of steps, but slow and steady wins the race! Make bathtime more enjoyable for your pup by giving her plenty of treats and praise. You might think training a dog to wear shoes or clothing is unnecessary, but consider this: A dog who lives in the city, where toxic chemicals are often used to melt ice on sidewalks, might need booties to help protect her paws from de-icers. Or how about a thin-coated, senior dog who could benefit from a sweater to help her retain body heat? Your dog might one day need to accept wearing shoes or clothing, so it’s a good idea to start practicing now. As with any activity that a dog might find less than desirable, it’s ideal to start early in life — during the puppy years, if possible. When it comes to encouraging your canine to accept clothing, start with something simple, like a doggie jacket without sleeves. Make getting dressed fun (read: offer treats) and reward your dog for staying calm when she’s wearing the clothing. If you want to try out booties, make sure you purchase a comfortable pair that’s large enough and doesn’t rub against your pup’s paws or legs. Be prepared to try out lots of booties until you find the ones that are right for your dog! What we’re really trying to say is: Don’t give up! With patience, practice and Milk-Bone ® treats, we bet you’ll be amazed at how far your dog can come with activities she used to loathe!